A heavy work week and sick kids mean no energy to blog over the last few days. Today, the kids were feeling better and I actually got a good nights sleep last night, so here I am, ready to go again. So because I haven’t made much, I want to share the knitted items I made over the holidays. The top picture is of a cowl I made with no pattern. I just kind of winged it. Same with the red cap. 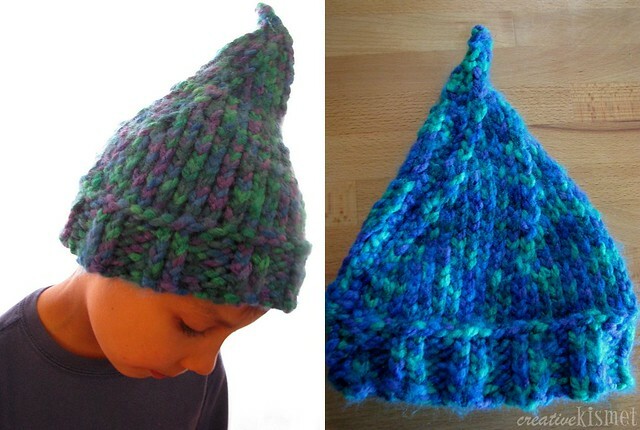 I used the meathead pattern for the blue/green/purple one, which we call the gnome hat. I love that my little I-guy not only picked out the yarn, loves his new hat and looks totally adorable in it. Now I am working on the bandana cowl which is stretching my brain power with all of the short rows. Just when I’ve gotten the hang of them, I have to put it down for a few days. I am also reading Wildwood with the kids, which is a great story. We have been reading one chapter a night and are now onto chapter 7. The illustrations are amazing too. This entry was posted in Knitting/Crochet, Reading. Bookmark the permalink. Hats are quick projects and I’ve knit many for my boy. That cowl will sure be lovely! Your knits are so cute! I love that pointy hat, and I want to make one for myself. Can’t wait to see the bandana cowl. Love the gnome hat! At our house we’ve been reading, The Spitting Image by A. Kurzweil each night and even my 11 year old who said “No thanks” when I said I wanted to read to them, succombed and is enjoying our reading together. Ahh, it’s a blessing in the challenging preteen era! Sorry to hear you’ve all been sick ~ but still being creative! Love the cowl and especially the gnome hat. 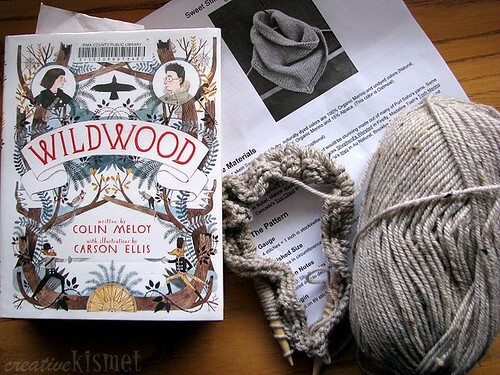 I’ve got Wildwood for myself and have been saving it. Glad to hear that it’s a good book. I hope everyone is totally healthy again. I know how hard that can be. Love your knitting. I still hope to give it the time it needs someday. Are you still doing advertising on your site? Nice knitting! That’s a great cowl, I love them but don’t think I could pull it off fashion-wise. I’m usually such a frumpy mom (and working in a warehouse isn’t doing much for my fashion sense, either), I think the cowl would be way too stylish for my life. The Wildwood drawings sucked me in, too. Rebecca loved that book, though it wasn’t one of my favorites. You guys should put Apothecary by Maile Meloy on your list, it’s a good one. Be forewarned, though, there’s a “first kiss” in it. Rebecca was scandalized, hee hee. Oh, and The Extraordinary Education of Nicholas Benedict was so very good! 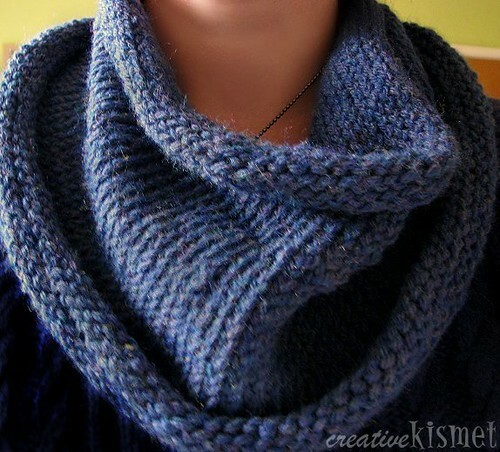 Regina, a wonderful scarf-collar turned out. I love to knit out of thick filaments. You can associate a set of scarves that fit under different clothes.